Every so often a relative of Costa’s who runs a sort of taxi service drives down from Albania to the Pelion. His visa restrictions allow him multiple entry into Greece for a 3-month period, after which he must remain outside the country for 6 months before he may enter again. Costa’s family are generous indeed in their gifts to us, and send the most delicious produce from their land whenever Bleddie drives his people carrier down. No pesticides are used. Ever. The women of the household work very, very hard to grow their food, to tend the animals, to prepare and preserve foodstuffs for the winter, all the while separated from Costa. Costa has toiled for a great many years here on the Pelion, away from his wife, his children, his grandchildren and the rest of his extended family for several months at a time. All their products are delicious, but it’s the potatoes that I’m crazy about. We’ve never eaten any like them before; none we can buy here come close to them in taste or texture, and that’s saying something as fresh produce on the Pelion is abundant and excellent. Costa was fascinated the first time I prepared baked potato with bacon, cheese and all the trimmings. Absolutely scrumptious, and fit for the gods. He’s tickled pink that Ron loves popcorn, and each care package contains enough to keep Ron happy until the next batch arrives. Bless his heart, it is, and the generosity of it all touches us deeply. Bleddie arrived on Monday. I’m sharing here with you just some of what he brought. And yes, we had baked potatoes with dinner on Monday, last night and will again today. Got to eat them fresh! 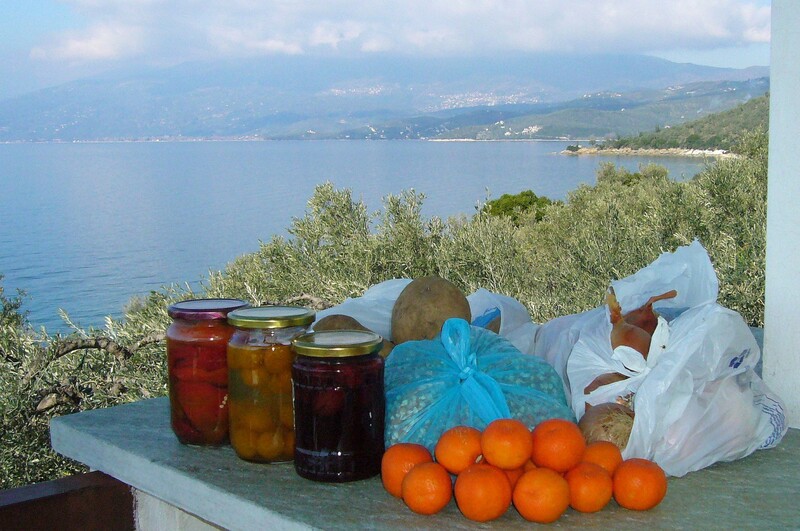 This entry was posted in Uncategorized and tagged Albania, fresh produce, Pelion. Bookmark the permalink. So very good and interesting to hear about Costa’s family and their pesticide-free production of this gorgeous bounty. What a beautiful photograph! I’m drooling. Pass the popcorn, Ron. How incredibly kind and generous he and his family are. Please tell him I send ‘hellos’. Those potatoes are enormous. What are the strange brown things in the white bag on the right? Pears? And the contents of the preserving jars? Those are onions – huge, sweet onions. The jars, from left to right: pickled red peppers, gooseberries – delish, tiny plums – extremely sweet. I forgot to include a large bag of his Starking apples, Golden Delicious apples, as well as oranges, in the pic. They are totally self-sufficient – make their own cheese, cure their meats etc and barter for fish.